Looking at this picture don't you think we'd have a good tasty dinner? I thought so. But that's not what happened. 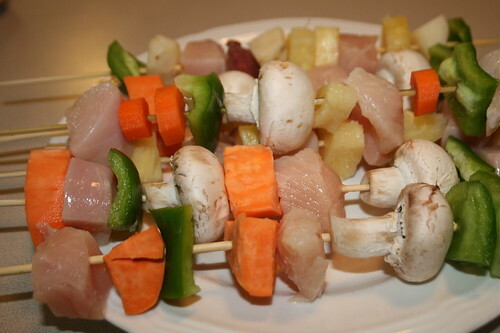 I hadn't made shish-ka-bobs in a long while. I'm not sure what went wrong, or that anything really did go wrong. It just didn't work out the way we had hoped. We tried some potatoes (regular and sweet) but they don't cook fast enough. I think for next time we'll ka-bob the meats and cook the veggies in foil. At least we had enough to pick at to be satisfied. Afterwards the cookies Mickey baked filled us to the top.